MASKATEER Active Me Gym Belt is an amazing product that really helps you with weight loss and faster results. This weight belt should be worn during workouts as it acts like a portable sauna, by making you sweat more removing excess water weight and keeping your core temperature high, which assists in removing toxins from your body and burns fat faster. This lifting belt is suitable for all activities including gym, running, jogging, hiking, travelling, yoga, and weight lifting. 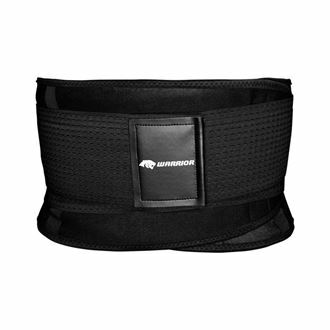 The MASKATEER Active Me sports belt has 4 flexi steel bones which cushions and compresses your torso area providing amazing back support during workouts, reduces the chance of injury, and help to maintain posture. This gym belt is very comfortable to wear with a double layer of ultra-light net and is made from soft breathable elastic neoprene. The fitness belt does not have any buckles or zips which cause irritation during workouts, but is installed with 2 strong mesh Velcro straps making it easy to put on. This women’s exercise belt is perfect for those who are active, regularly exercise but are looking to focus more on their torso area. How To Maintain Your MASKATEER Gym Belt? Started working out again but been having back pains. This sports belt really does provide great back support during workouts and makes me sweat more. I’m always taking it to the gym with me. Love it. Hi Rebecca. Thank you for leaving a review and we're glad to hear that it's helping you with the back pain. Keep up the workouts. I’m never one to review products, but this gets a 5* from me. Delivery was efficient and the product was so comfortable. I ordered 2 more 30 mins after wearing it. One for my best friend and another for myself. One solely for the gym as it gets a little sweaty and the other to wear under my clothes at home and when I’m out. I Highly recommend this product. Hi Rachel, thank you for your purchase and we are so glad to hear you enjoying our product. Keep up the waist training. Still trying it out but it’s feels great. I’ve worn it twice to the gym and when I got home I realised a little difference with my tummy, however this was after I worked out for 2 hours straight wearing the belt. So far, I’m enjoying it. Thank you for your review. We look forward to hear about your progress. I don’t really exercise much but I love the way it supports my back during house chores and popping out to the local supermarket. Those with back issues like me, give this a try. This belt is so good. Feels like I'm burning more calories and is definitely working my abs better. Been waist training for a while and lost 2 inches off my waist. 5 stars because it really is an excellent product. But too large for me. Was my mistake in measurement! Such an amazing gym belt. Love working out in it. I don’t go to the gym but needed something for my back pain. This works wonders. I wear it around the house and even at work under my uniform. It’s gives great back support. Fabulous product. My back support arrived yesterday and already I feel it's working. Pleasantly surprise by the quality and support level of this belt. Huge improvement. It really does help to keep your posture right and your tummy tight. I highly recommend it! I was 79cm when I bought my waist trainer. It arrived last week and I have been wearing it every day for about 2-3 hours. I’ve also been to the gym 3 times this week and I’ve managed to lose an inch off my waist. I’m now 76cm. I’m so happy with this purchase and would definitely recommend to others. It really does work. I just love the results this belt gives. I was 70cm waist and ordered a medium. After 5 days of wearing it I've managed to lose 2 cm. To be honest I think it goes hand in hand with the workouts and diet that I have started. So happy with the results. Making a difference after only wearing for a few hours every other day. I also feel that my posture has improved which is great. Its such a good accessory to wear when working out. I wear it to the gym and whilst jogging. It makes me sweat so much more and gives me great back support during weight sessions. It’s a no brainer. I ordered the belt to make my workouts more intense and effective. I started my diet in September and used the same belt every other day and I already lost 10 kgs. After the 45 minute workout the belt is completely wet and helps you sweat. Perfect for running or just wearing it at home. Great product, highly recommended. Comfortable, adjustable, very good back support and can easily do workouts which makes you sweat underneath. Very impressed. It doesn't show under loose tops, so i could wear it at work as well. Thinking to buy it for mum and grandma for christmas! I’m a 70cm waist and ordered the medium and it fits perfect. I love wearing it to the gym and exercises in it. When I take it off at the end, my stomach is completely drenched in sweat. I have noticed that my waist have dropped in a week so I'm extremely pleased with my purchase.